As winter transitions to spring, the risk of basement flooding increases. Large deposits of snow melt and runoff can seep into your home, causing a serious headache. There are, however, a number of measures you can take to reduce the risks of basement flooding. 1. Divert water away from your home. Keep your gutters clean. One of the most easily preventable causes of home flooding is ensuring that your gutters are free of clogs. Rainwater should flow smoothly into your downspouts and away from your home. Ensure downspouts divert water far from home. Make sure your downspouts direct the water at least 3 metres from your home. This will ensure that water doesn't drain into the basement. 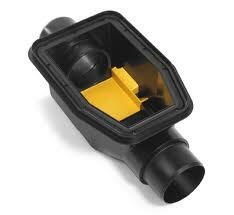 Install a backflow valve. Backflow valves (also known as check valves) allow sewage to exit the home through the sewage pipes, but stops sewage from going the other way. When sewage is forced back into your house, which would normally cause a sewage backup, a flap closes and prevents it from doing so. Install a sump pump. To prevent rain water from flooding your basement, a sump pump is a highly effective solution. Excess rain water is pumped safely away from the house, stopping you from being inundated. Be sure to check with your municipality first, since these kinds of installations often require a permit. Keep valuables off the floor. If you live in a flood-prone area, keep your valuables off the floor. Instead of storing your old photo albums in a box on the ground, install a shelf so that in the event that you're overwhelmed with flood water, your most priceless memories will be safe. This also goes for items of monetary value -- for instance, be sure your home theatre system is stored above the ground. Keep furniture elevated. Finally, you can elevate your furniture with shims and casters, to give yourself a little bit of time before your couches and chairs are destroyed. Winter driving in Alberta can be a dangerous task. Be safe out there in the colder months by following these simple driving tips from the insurance pros at Sharp! Keep a safe distance from the car ahead of you. It takes much longer to stop on icy roads, so be sure to stay at least four seconds behind the car in front of you. Tailgating in winter is a sure way to get into a fender bender, or worse! Keep your speed appropriate for the road conditions. When the roads are snowy or icy, be sure to drop your speed below the posted speed limit. The posted speed limit is intended to be the speed you should drive when conditions are optimum. Don't be afraid to drive below the limit. Accelerate and brake slowly. If you hit the gas hard while accelerating, it's likely you'll lose traction and not move very far at all. When stopping, be sure to brake slowly to avoid skidding. Be visible. In blizzard conditions, it's important for cars around you to be able to see you. Turn on your headlights to make yourself more visible. Know how to handle a skid. If you find yourself skidding and out of control, release the brakes if you were pressing them, and steer in the direction you want to go. If you're skidding in a straight line, hold down the clutch or shift into neutral. With these simple tips in mind, you will be that much safer on the road during winter conditions!